Newlyweds Alice and Jake are a picture-perfect couple. Alice, once a singer in a well-known rock band, is now a successful lawyer. Jake is a partner in an up-and-coming psychology practice. Their life together holds endless possibilities. After receiving an enticing wedding gift from one of Alice’s prominent clients, they decide to join an exclusive and mysterious group known only as the Pact.The goal of the Pact seems simple: to keep marriages happy and intact. And most of its rules make sense. Always answer the phone when your spouse calls. Exchange thoughtful gifts monthly. Plan a trip together once per quarter …Never mention the Pact to anyone.Alice and Jake are initially seduced by the glamorous parties, the sense of community, their widening social circle of like-minded couples.And then one of them breaks the rules.The young lovers are about to discover that for adherents to the Pact, membership, like marriage, is for life. 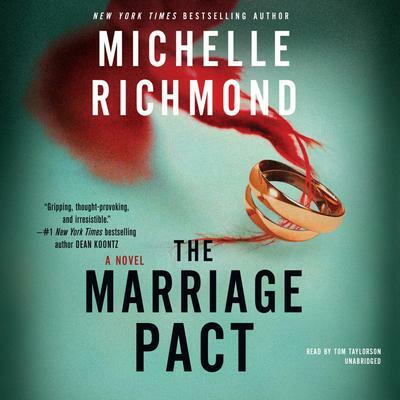 And the Pact will go to any lengths to enforce that rule.For Jake and Alice, the marriage of their dreams is about to become their worst nightmare.In this relentlessly paced novel of psychological suspense, New York Times bestselling author Michelle Richmond crafts an intense and shocking tale that asks: How far would you go to protect your marriage?